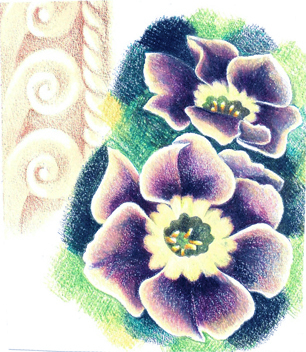 The post about the Auricula flowers seems to have hit the spot, so here is some more eye candy inspired by those lovely flowers. 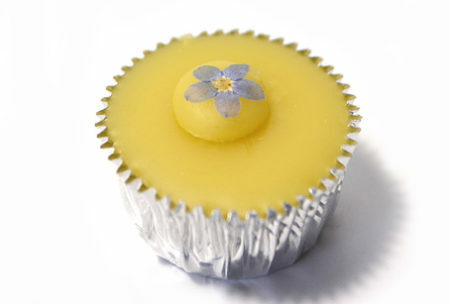 Stick with it, there’s beady inspiration at the end. This time it’s textile related I know how we share a love of fabrics (yarns, beads…). I used to make small quilts, mostly small because of the time and lack of space thing, but also small because it’s easier to finish. 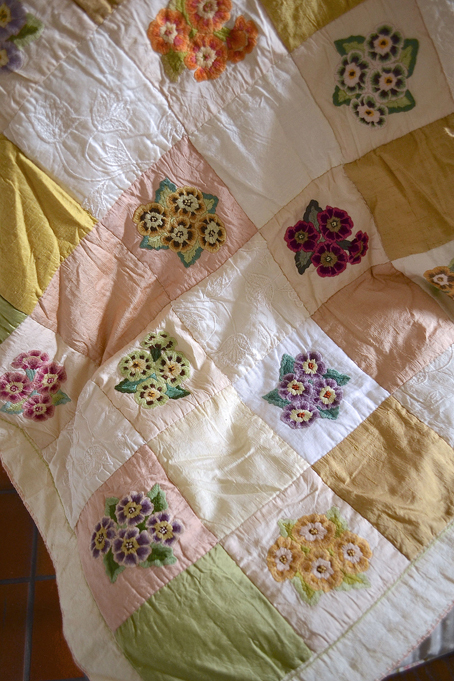 This quilt is made of pure silk, mostly gleaned from family remnant stashes, a bit of wedding dress here, a snippet of ancient ball gown there, and the spaces filled with store bought pieces. Some of the blocks though, are hand embroidered. 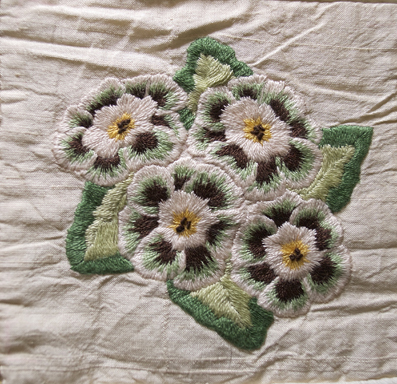 It took a long time to do the embroidery, but it was the best fun to choose the stranded cottons to work with, each panel is a portrait of an Auricula worked in satin stitch and french knots. The whole thing had started by making drawings, and it was these drawings that later became the inspiration for a beaded version of the flower; with a bit of tweaking because extra petals means playing with more lovely beads. 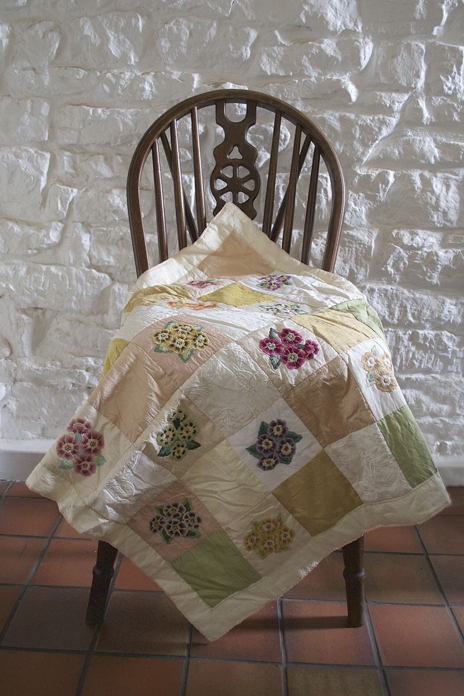 The result was Country Garden, which a fun workshop now available as the pattern. Worked in Albion and Peyote stitch, the pattern includes my favourite beady leaves. 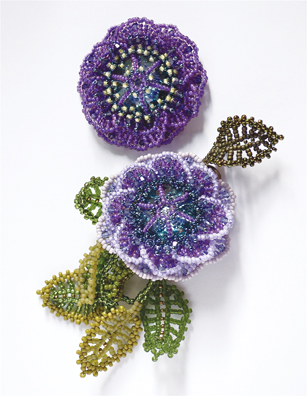 The Flower is worked over an acrylic stone (you can find them here) and looks gorgeous as a brooch, a corsage, or combined with beady ropes or bracelets to make a floral focal. Find downloadable pattern in the pdf store click here.